QIS Insurance Services LLC is an Independent Insurance Agency, which means we represent many different companies so we can find the one that is right for you. We can shop your insurance for you instead of you having to call around. 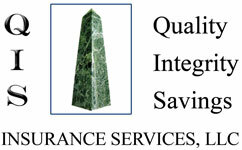 We represent you, our client and not the big insurance companies. Our staff has the knowledge and experience of our insurance products to provide maximum benefit and protection to our clients. Let one of our licensed professional insurance agents help you with any of your personal or business insurance needs serving Los Angeles, Redondo Beach, Torrance, and the whole State of California.